Yet another snow day and I finally have time to do some creating and start a blog so I can share my creations. Phew! It might take me time to figure all of this out, but here I go. I wanted to join in on the Zentangle challenges and really felt that I should get a blog going. Today I created the "Breathe" challenge. I had nice music from Pandora going (zen garden radio), had to get my handy dandy magnifier ready since my eyes tend to get angry if I don't, got out a new tile, and began. Breathe. It was easy to concentrate on my breathing since the magnifier moved with my breath. I started with a string of a nose and moved the air in and out of it. The breath in circles the heart then down to the belly. In and out. In and out. I got so relaxed that I was beginning to fall asleep by the end of it. Perhaps I get too relaxed. Wow, you accomplished a lot today! 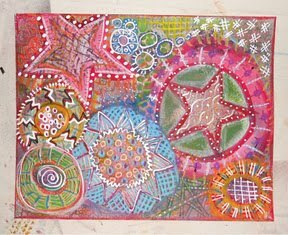 Welcome to the world of Blogging and the fascinating world of zentangles too! Your tile represents the idea of this challenge well, I can almost hear you breathing. Will look forward to seeing more of your work as these challenges continue. Thanks, Joni! I'm looking forward to the future challenges. A refreshing breeze and the breathing is a pleasure! See Jane tangle! LOL What a lovely tile - a visual feast. Wow! I am looking forward to your musings. How perfect! Oh Jane, don't you love a snow day so you can just catch your breath. 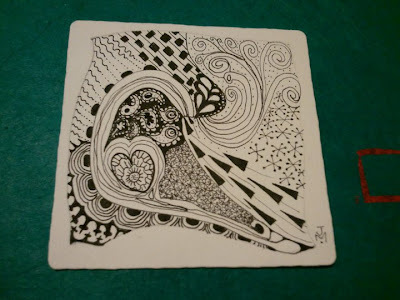 You can see the breath forming in your zentangle! Lovely! Great tangle, love your flowing arrows and paisley. What a lovely nose! Welcome to the blog world! Hey Sadia, you're not too far away; I'm in Londonderry. We'll have to get together some time!